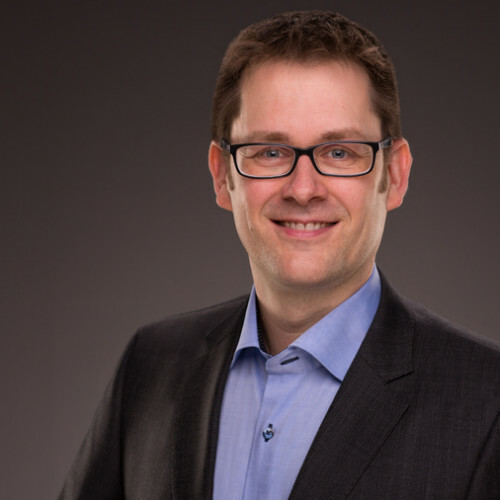 In the last two years nearly every major ISV has adapted their licensing models to enable engineers to access flexible and scalable HPC resources in the cloud. There are various licensing options: from Bring Your Own License (BYOL), Bring Your Own Tokens (BYOT) or a combination of both. This allows engineers to either use their on-premise licenses in the cloud, acquire additional licenses on demand, or even expand their on-premise licenses if access to larger resources is required. These new licensing options and the availability of unlimited HPC resources in the cloud offer new use scenarios. Let’s assume for a moment that we are able to solve our application on an ideal hardware configuration. We have access to benchmarks and know the scaling. In theory we could include more and more compute resources to further speed up our simulations. The example we look at is a large ANSYS Fluent model running on our local workstation for about 13 days (on 4 cores). 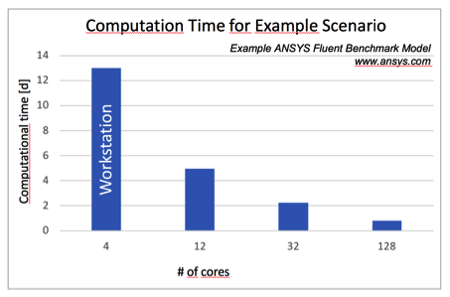 Since ANSYS Fluent scales very nicely we are able to significantly speed up the simulation reducing the compute time to less than a day on 128 cores. But how much does this cost? Talking about costs at this point is often the wrong way to look at it. There is lots of value in getting engineering results faster or deeper insights into the products we develop. Faster time to market is very often invaluable. But for the sake of our little thought experiment: What do we need to pay extra? Now this might be surprising - but in some cases less! Simulation models with good scalability profit strongly from the flexibility that ANSYS HPC Packs offer. Up to a sweet spot, the total costs of running a model on cloud hardware gets cheaper the more hardware you take – and the faster you run! Because you use less time to solve your model, your cost can actually be lower with more hardware. 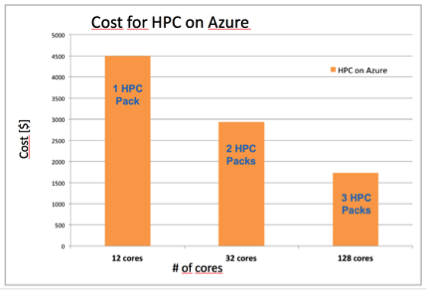 Costs for running ANSYS HPC on Azure. In case you are running large simulations or need to solve lots of model variations it is worth to take a closer look. You might end up saving a lot of time and … costs.